Yay! Our rains have finally arrived! Of course, so has the humidity and the flies. Flies, and more flies! Ugh! This is just exactly what Hershey thinks about all the crazy flies. That's probably what he thinks about having to wear his fly mask all the time, too. And, did you hear about the crazy egg cooking frenzy I had? Yep! 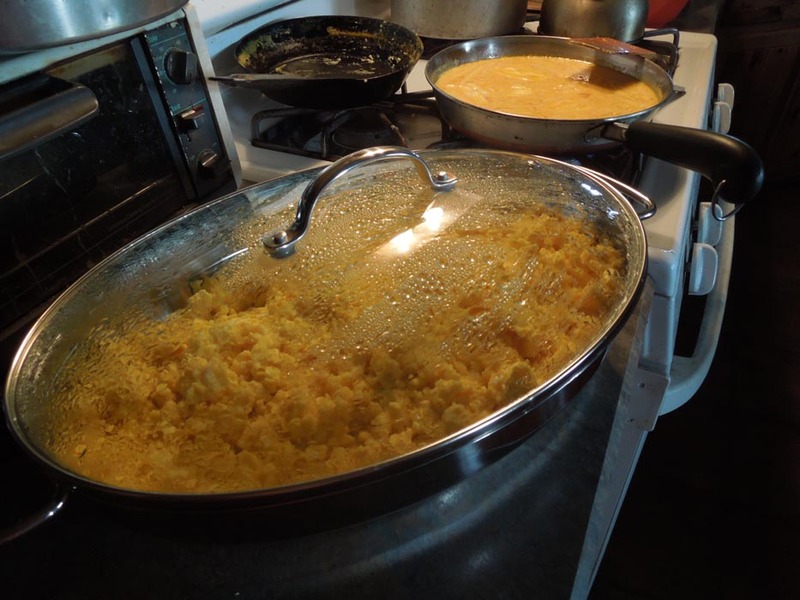 I cooked 5 1/2 dozen (that's 66 eggs) for our art guild brunch. We won't talk about the batch I burned... the chickens ate the incriminating evidence. 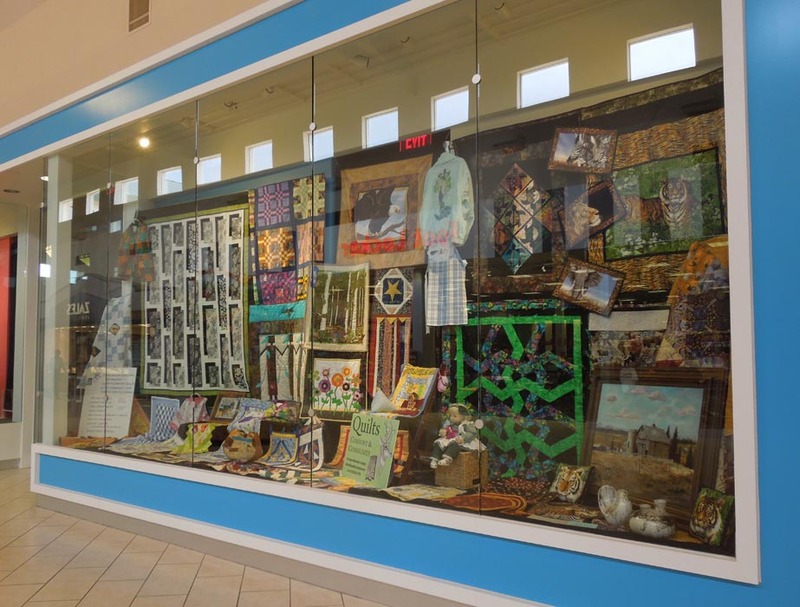 A random stroll through our mall (yes, we have one - just one!) surprised me with a fun kind of crazy - crazy quilts! 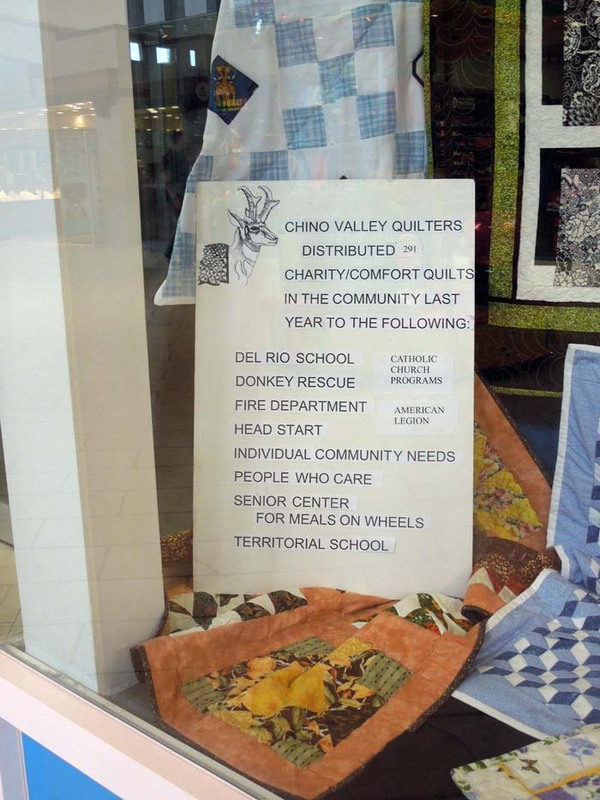 This local group donates a lot of their items, too - how neat is that?! My Funtry Friday ended with another splash of craziness. I dragged the hose over to fill up Hershey's water. While the water is rising to the top, I see some movement. My mind says, "no, you are not seeing what you think you are seeing." 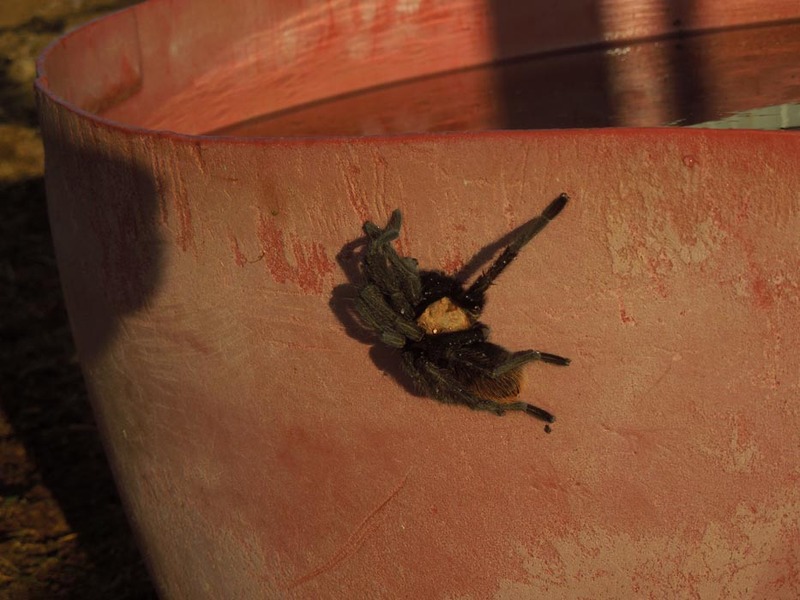 This crawled out of the water barrel, and perched on the side. Excuse me? So I did what any red-blooded-blogger would do. I ran to the house to grab my camera (because I had not taken my own blogging advice) and when I returned I was delighted to see that this arachnid was still posing - with sparkly water drops glistening. But I am still clueless about why this hairy little dude crawled all the way up the side and into the water barrel. Who knows the mind of a tarantula...? Crazy. Sometimes it's just a little crazier around here! Especially on Funtry Friday. I'm afraid I'd have screamed if I saw that hairy spider!! Yikes! Your eggs look great. And I love crazy quilts. Well, it wasn't moving... and I didn't see it today... So maybe I have avoided the scream stage. Given your artistic talents & sense of humor, I'd think there would be some decoration on Hershey's fly mask. So chickens are cannibals? No hairy spiders that big around here but we do have scorpions...they measure about 1" long! Ah, crazy quilts, sort of what I've been working on. Thanks for sharing your Funtry Fridays. No way I would have gotten a camera, I would have been long gone, Spiders and I do not mix especially big ones like tarantulas. The eggs look good and since I have not had breakfast yet they made me hungry. Your eggs look yummy! I remember making a scrambled omelet type casserole for a brunch...had cheese and ham in it. Tarantula? In your yard? Really? and you go get a camera? Not me, I'd get out. So can Hershey see through the fly mask? 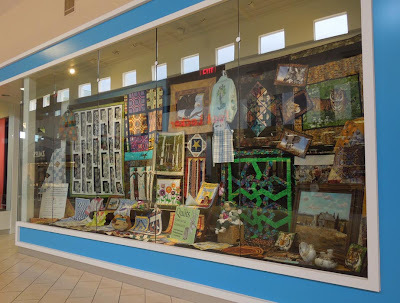 The crazy quilts are great! Yes - it is kind of a net like fabric that is too small for the flies to get through. He can see out of it day or night. Glad you enjoyed the craziness! That spider would have creeped me out. Love Hershey's expression! No way I could have just walked back out there with a camera! Wow! yikes on the arachnid! I probably would have gotten the camera, too, though. I had the same thought Jane did about the chickens. poor Hershey is right! Can he see? That IS great that the quilting group donates their items. Nice to now I have company in the camera dash! Chickens will eat just about anything that doesn't sting or try to eat them first. 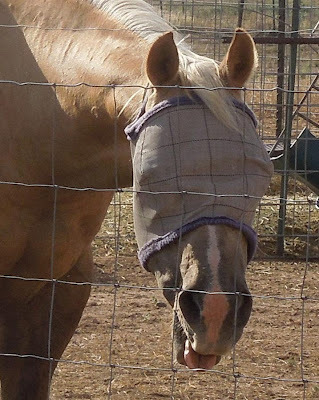 Hershey can see - the fly mask is made of a net fabric. I was surprised how well I could see out of it. LOL - yep, I tested one years ago. "Bluck!" That is what Hersey is saying about the flies! We have NOT gotten the rain - AARRGGHH! 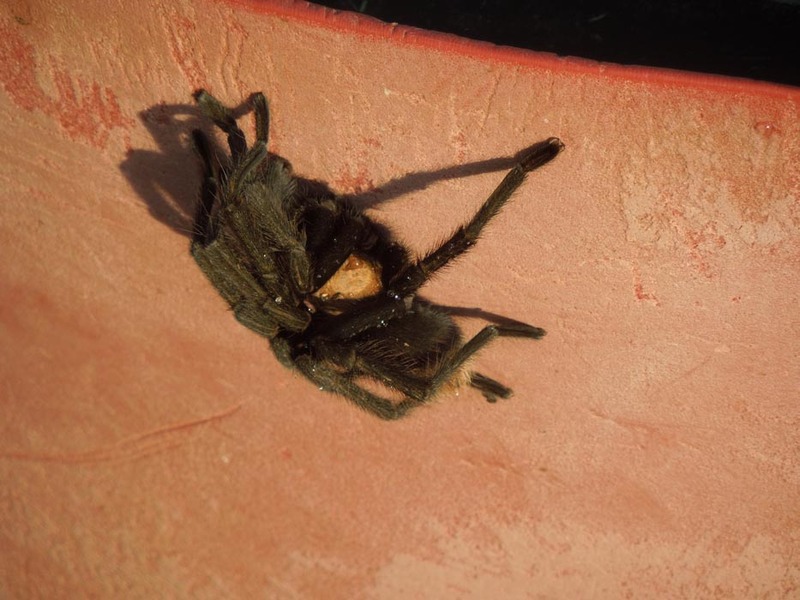 That arachnid looks more like a common Wolf Spider to me. They are very good for your garden, etc., so you should stop drowning them, okay?! LOL!! As for the flies - I'm with Hershey! Blech! Oy - hope you get some rain soon! We had another gentle shower today. PTL! Lots of fun at your place... and ewwwwwie!